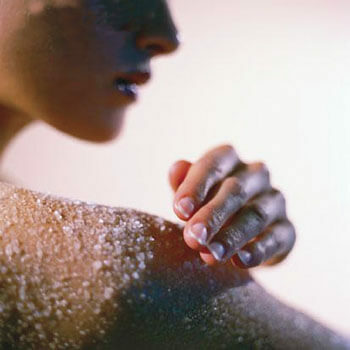 A salt glow combining sea salt and essential oils can leave your skin feeling soft, fragrant and renewed! Rosemary Verbenon – Traditionally used for cellular regeneration, wrinkled, aging, burned, scarred or sundamaged skin, the treatment of oily skin and scalp, and dandruff. French authorities say that it can help balance the nervous system, support the liver and gall bladder, that it is an endocrine regulator, and useful for respiratory infections. Peppermint – Traditionally used for stimulating lymphatic flow, cooling in low dilutions, warming in high dilutions. Mentally, it clears the brain, helps concentration, is a restorative in cases of mental fatigue, and is a mental stimulant. Lemongrass – Traditionally considered an excellent overall physical tonic. An effective skin toner that can open pores. It is said to boost the parasympathetic nervous system which hastens recovery from illness. The essential oil is stimulating and invigorating, It is helpful for treating symptoms of jet lag, clearing the head and relieving fatigue. Ravensara – Traditionally used for cases of edema, it stimulates the drainage of toxins. Recommended as an immune stimulant. Ravensara is used as both a tonic for the nerves, and as a remedy for physical, nervous and mental fatigue. Strongly antiviral. There is no more useful essential oil for combating the flu. Palma Rosa – Traditionally, Palma Rosa is very effective in blends for treating various skin conditions as it helps balance production of sebum, thus being useful for both extremely dry and oily skin. A strongly anti-infectious oil, as well as being anti-fungal. It is said to aid in the release of anger and grief. Patchouli – Traditionally used to tone and tighten the skin, and is used in many anti-wrinkle products. Regulates oily skin and dandruff. It is known to be useful in combating cellulite. Patchouli is an effective anti-inflammatory for the skin, helpful in healing cracked or inflamed skin, acne, dermatitis, and eczema. Roman Chamomile – Traditionally used for its sedative and pain-relieving properties. Wonderfully calming and stress-relieving. Useful for combating menstrual cramps. Effective for insomnia and headaches brought about by stress and tension. Helpful for inflamed joints and muscle and joint pain. Rose Geranium – Traditionally used for bruises, cuts, ulcers, broken capillaries, dermatitis, and its anti-inflammatory properties. It is believed to balance sebum (making it the oil of choice for combination skin) and to keep the skin smooth and supple. Thought to bring an overall sense of balance when used in aromatherapy. Used to alleviate problems with menopause and menstruation. High Altitude Bulgarian Lavender – Traditionally used for its anti-bacterial, anti-fungal, and, possibly, anti-viral properties. Lavender functions as an adaptogen, aiding in restoring the body and the spirit to balance. This particular variety of lavender has a heady, floral aroma, with much less of the bright green and camphorous smell of lesser-quality varieties.